Currently, many phone owners are about to be in the hunt for a new smart phone. Once that hunt begins, two devices that will likely appear on the radar are the just announced Samsung Galaxy S5 and Apple's flagship iPhone 5S. The newly-unveiled Galaxy S is reported to arrive in April 11 to tempt both prospective and current Apple users. Well, is Samsung's latest smart phone really a good alternative to iPhone 5S? 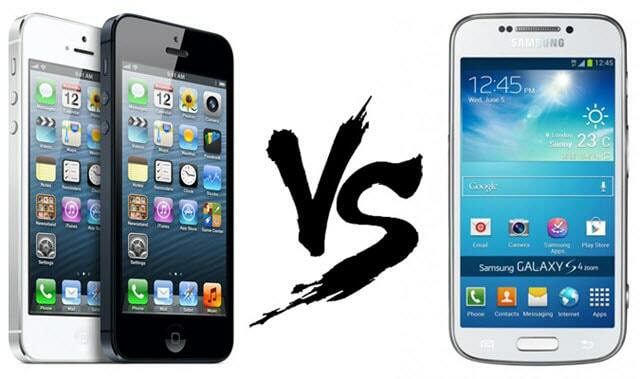 Stay on and read the following Galaxy S5 vs iPhone 5S comparison review to find out. Right now, eyes down for the best smart phone comparison of the year: it's Team Android vs Team iPhone, and here our Galaxy S5 vs iPhone 5S comparison review will mainly focus on their display, processor & performance, battery life and other features. Before Galaxy S5 delivers its debut at MWC 2014, a lot of rumblings argue that G S5 would be armed with an eye-wateringly crisp 2K+ display, which sounds a touch of far-fetched and later is proved to a hot air. Galaxy S5 retains a Super AMOLED display - full HD screen (1920x1080), which means it has a slightly lower pixel density of 430ppi compared to 441ppi on Galaxy S4. Moreover, you may be disappointed to find out that its display is only marginally larger than the Galaxy S4's with merely 5.1 inch. Having said that, the display is pretty good and it's just coming in a way different from what we expected. iPhone 5S is a delicate yet beautiful handheld device with 4 inch Retina screen in 1136 x 640 pixels resolution, which makes for a pixel density of 326 ppi. Although G S5 with a bigger display and greater resolution is categorically better than iPhone 5S, it is unlikely your eyes will tell the difference between 430ppi and 326ppi. In addition, it's true that everyone has his own taste and not everyone appreciates the bigger and heavier one to carry and use. Samsung Galaxy S5 features a 2.5GHz Snapdragon 805 processor (Qualcomm Krait). Yet the ointment is that you may anticipate a whopping 3GB RAM but it appears from Samsung's spec sheet that it is 2GB. Even so, unquestionably, it still can bring you a smooth yet nifty performance. The iPhone 5S, on the other hand, owns a 64-bit A7 processor running at 1.2- to 1.3GHz. It's a dual-core Cyclone processor alongside with 1GB of DDR3 RAM. Hence, you would never find iPhone 5S to have any major performance issues, e.g., feeling laggy or something. The fire-new Galaxy S5 is equipped with a 2800mAh battery, which should give the S5 enough juice to easily last a day (Samsung claims 21 hours of talk time or 390 hours standby). And Samsung S5 garners an efficient solution to get more out of a battery that the Ultra Power Saving Mode turns the display to black and white, and shuts down all unnecessary features to minimize the battery consumption. Can't help wowing about this, right? Comparatively, iPhone 5S battery life is in a slightly inferior position that it offers talk time only up to 10 hours on 3G, or up to 250 hours standby. Obviously, more efforts from Apple need to be made in this aspect. Wish iPhone 6 would perfect it and absorb the Galaxy S5's strength. As the representatives of Android and Apple phones, both galaxy S5 and iPhone 5S have their unique features. Galaxy S5 features a fingerprint reader embedded inside of its own home button which also offers easier access to the home screen and more protection for the phone. Plus, it also comes with something called Kids Mode that lets parents hand over their smart phone to their kids without anything disastrous happening to their data. One point to refer is that Galaxy S5 TouchWiz gains a subtle facelift, like the homepage overview when pinched in on a home screen will appear as panels, not a grid. Well, iPhone 5s has Apple's newest hardware inclusions and upgrades, namely Touch ID, the M7 motion co-processor, 64-bit architecture and so on. I bet these features are not strange to Apple followers. Among them, Touch ID is a joy to use, which is built right into the Home button and registration of a thumb, finger or both – five digits can be registered. The above comparison between Galaxy S5 and iPhone 5S is just the tip of the iceberg. Other details are concluded in the below table. 16GB, 32GB and 64GB capacities but lack of a microSD card slot for expansion. Assuming that you are keen on playing with the latest gizmos and gadgets, Samsung Galaxy S5 is definitely tailor-made for you, as it's packed to the brim with much more features (some mentioned above). Maybe this Samsung flagship isn't the most well crafted one you might find and its plastic body possibly lets you feel cheap and fragile, nevertheless, Samsung Galaxy S5 is the sort of go-to phone you can pick with confidence. It's not perfect, but if you're struggling to make a decision and you have to have Android, it's a safe bet that's available from every major carrier. To faithful Apple fans, iPhone 5s is always being the coolest smart phone ever made. With an advanced yet amazing operating system, a stunning camera and Apple's trademark polish, iPhone 5S tightly wins their heart. Although it's a truth that its battery is atrocious compared to Galaxy S5, and that it continues to lack expandable storage, its build quality is phenomenal, the new iOS 7 is elegant, and the iPhone 5s's photos are simply terrific. It does have its flaws, but that doesn't stop iPhone 5S from being a superb smart phone you can buy. Aside from that, provided you find out interesting YouTube videos and want to download them and transfer to Samsung Galaxy S5 or iPhone 5S, MacX Video Converter Pro can do you a big favor. Besides downloading YouTube videos, you can also apply it to convert both SD videos and HD videos like MOV, FLV, AVCHD, MTS and MKV to iPhone 5S or Samsung Galaxy S5 for playback while moving around. For unrestricted DVD playback on Samsung Galaxy S5 and iPhone 5S, the No.1 fast MacX DVD Ripper Pro is your ultimate choice. It can rip copy-protected DVD to a format compatibile with both Samsung's new flagship and Apple's high-end smartphone iPhone 5S. 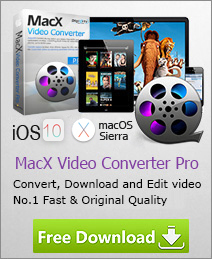 Here is a list of the top free Mac video converter for you to convert among HD and SD videos on Mac OS, like MKV to AVI, AVCHD to MOV, M2TS to MP4, AVI to MP4 etc; and convert video to your iPhone, Samsung, iPad, HTC, etc, do not miss this to convert video free with best free video converter for Mac. This tutorial can best remove your annoyance for it introduces you an easy solution to convert DVD to Android device like Samsung Galaxy S5/S4, HTC One 2, etc with a professional DVD ripper for android tablet.